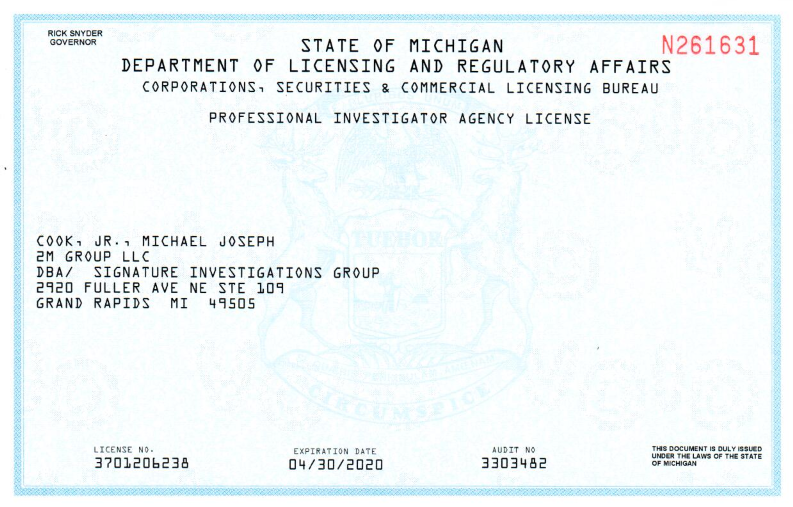 At Signature Investigations Group in Grand Rapids, we utilize a wide variety of investigative techniques while drawing on our counter-surveillance abilities, forethought, hindsight & heightened awareness. We employ an arsenal of state-of-the-art equipment from discreet professional surveillance vehicles, typically without detection. A variety of attire allows us to obtain film and evidence needed to resolve suspicions. The cases we work are primarily in Western Michigan, but we have covered cases as far away as Houghton/Hancock, Marquette, Saginaw and the Detroit area. Our investigations are broad and include: surveillance, background checks, locates, skip tracing, cheating spouse, child abuse, elder care abuse, elder financial abuse, child custody, pre-marital, child endangerment, disability, child neglect, civil fraud, dead beat parent, divorce, document retrieval, elder abuse, elder neglect, embezzlement, employee drug use and sales, employee theft, espionage, workplace theft, hidden cameras, mystery shopping, nanny cam, process service, refuse retrieval (trash run), spousal abuse, stalking, undercover, undue influence, teen investigations and surveillance, theft, vandalism, workman’s compensation fraud and many other investigations. Our five types of background screenings are: caregiver screening, date/marriage screening, nanny screening, pre-employment screening and tenant screening. Through our data providers and experience, we will give you verified information on your prospective employees. Relying on our national consortium of investigators, we will complete your due-diligence screening in a timely, cost-efficient manner. We also comply with all EEOC, ADA, FTC and FCRA guidelines set forth in compliance with State, Local and Federal Laws. SIG also has several contacts for expanding our searches if necessary including the US, Canada, Mexico and several European Countries.